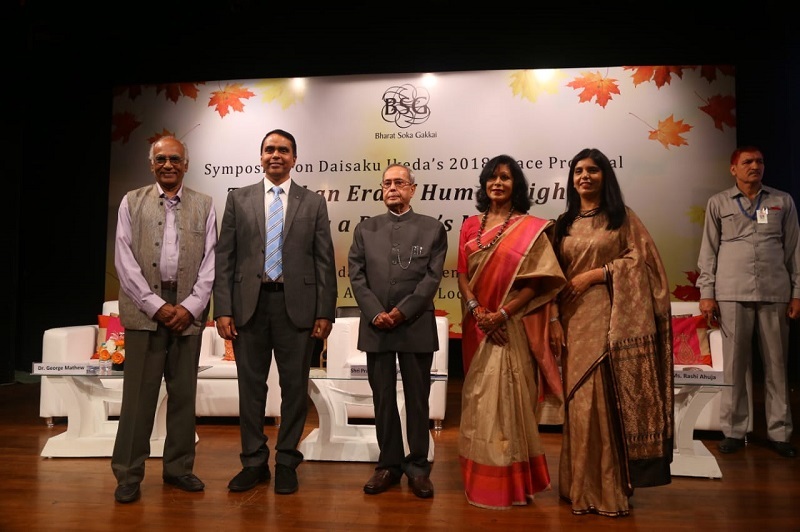 I am happy to be present today at the Bharat Soka Gakkai, alongside a forum that discusses Dai-saku Ikeda’s peace proposal for 2018 titled“Toward an Era of Human Rights: Building a People’s Movement” submitted to the United Nations. 2. What struck a deep chord with me is a statement of Ikeda and I quote, “being able to contribute in some way to the happiness of others and the world, be it through work or in some other capacity, brings one joy and fulfillment in life”. These words echo the earnest desire to contribute to the welfare of the society and reflect consistent effort through Annual Peace Proposals spanning over the last 36 years. “University is there to offer us opportunity for working together in a common pursuit of truth, sharing together our common intellectual heritage, to enable us to realize that artists in all parts of the world have created forms of beauty, scientists discovered secrets of the material universe, philosophers solved the problems of existence, saints made spiritual truths organic in their lives, not merely for some particular race to which they belonged, but for all mankind. 5. I would, therefore, urge all educationalists and guests assembled here to think about the future of Indian Universities as a continuation of India’s rich history and heritage of education by drawing inspiration from reforms by great philosophers and visionaries, such as Tagore, who sought to revive the ancient Buddhist tradition of higher learning and research in a “common pursuit of truth” for all mankind. As our “Universities of the Future” gear up for global competition to find their place on the tables of institutional rankings, let us not forget the difference between “world-class” and “world-minded”. 6. In fact, India's association with human rights movement runs deep. Even before independence, India was active at the international level in its advocacy of the promotion and protection of human rights. The quest for realization of human rights and respect for human dignity was core to our independence Movement. The Indian independence Movement was also a major influence and catalyst for similar movements in other parts of the world. 7. As early as 1895, our great leader, Bal Gangadhar Tilak initiated the Swaraj Bill which contained, the right to freedom of speech and expression, the right to equality, the right to vote and so on. After the publication of the Montague-Chelmsford Report, the Indian National Congress at its special session at Bombay demanded that the Government of India Act should contain a declaration of Rights of People embodying basic human rights. The Indian National Congress Session at Madras in 1927 passed a resolution that the future Constitution of India must have a declaration of Fundamental Rights. The Motilal Nehru Committee in 1928 and Tej Bahadur Sapru Committee in 1944-45 which drafted a Constitution for India laid emphasis on Fundamental Rights. 8. Father of our nation, Mahatma Gandhi, was widely recognized as amongst the foremost human rights activists of the world at the time the Universal Declaration of Human Rights was being drafted. Mahatma Gandhi was therefore consulted on the elements that should go into the Universal Declaration of Human Rights. The essence of Gandhiji's political philosophy is the empowerment of every individual and protecting the dignity and self-respect of every human being. This is also the central message of the Universal Declaration of Human Rights that was adopted by the United Nations General Assembly on 10th December, 1948 (vide Resolution No. 217 A) consisting of a Preamble and 30 articles setting forth the Human Rights and Fundamental Freedoms to which all men and women, everywhere in the world, are entitled, without any discrimination. It also recognizes that rights come along with duties, an idea strongly propounded by Mahatma Gandhi. 9. Since independence, we have been unambiguous in our commitment to the preservation and protection of human rights globally as well as within the country. India accepts that certain rights have always been understood by man to be basic such as the right to life and liberty. If human rights are inseparable from man, they should be equal in their application to all human beings at all places and at all times. These rights are fundamental to the very existence of mankind and not merely for the benefit of one class or one section of the society. Our Constitution reflects this position. The right to life and personal liberty is available to all people within its territory and not just its citizens. 10. I would like to share what Dr. B.R. Ambedkar, Chairman, Drafting Committee, of our Constitution observed on the eve of adopting the Constitution. He said, and I quote, "On 26th January 1950, we are going to enter into a life of contradictions. In politics, we will have equality and in social and economic structure, continue to deny the principle of one man one value. How long shall we continue to live this life of contradictions? How long shall we continue to deny equality in our social and economic life? If we continue to deny it for long, we will do so only by putting our political democracy in peril. We must remove this contradiction at the earliest possible moment, else, those who suffer from inequality will blow up the structure of democracy which this Constituent Assembly has so laboriously built up". 11. We have an outstanding Constitution and a plethora of sound laws and policies to uphold different dimensions of human rights. However, such an elaborate legal infrastructure to manage human rights will count for nothing if implementation is lacking in form and spirit. We must therefore focus efforts on translating our laws and Constitutional provisions into a reality for the common man. This is where global organizations like Soka Gakkai come into play. And I am happy that today that this topic has been chosen by Bharat Soka Gakkai for the awareness of all, with a firm belief that a fundamental change in a single individual can bring about a great transformation in society. 12. One of the themes of the Peace Proposal is that the bonds that form a culture of human rights are woven through the experience of joy shared with others. Ikeda talks about a sense of mutually shared joy which arises from efforts to support each person across differences, so they may continue advancing as they take on life’s challenges. 13. The capacity for compassion and empathy is the true foundation of our civilization. But every day, we see increased violence around us. At the heart of this violence is darkness, fear and mistrust. We must free our public discourse from all forms of violence, physical as well as verbal. Only a non-violent society can ensure the participation of all sections of the people, especially the marginalized and the dispossessed in the democratic process. Power of non-violence has to be resurrected to build a compassionate and caring society. 14. The gathering today is diverse and comprises participants from varied age groups and fields. It’s heartening to see many youth in participation today. And I couldn’t agree more with the Soka Gakkai conviction that Youth have a special aptitude for sharing what they have learnt which makes them a powerful force for expanding the circle of those committed to overcoming and shifting the global current from one of division and conflict to one of coexistence. 15. To my young friends, I would like to reassert that the “challenge of creating the new reality of a global society where all may live in peace and dignity is not beyond our reach. And it is my firm belief that the solidarity of ordinary people will be the driving force for its realization”. 16. Before concluding I wish to call out to the youth of India, to unite together, become the voice of change to make the world - one global society in which no one is left behind. And I congratulate Bharat Soka Gakkai for their activities and initiatives and their spirit of unity.